The 35th Infantry Regiment Association salutes our fallen brother, PFC Stanley M. Jamrock, who died in the service of his country on February 15th, 1968 in Quang Nam Province, Vietnam. The cause of death was listed as Small Arms/AW. At the time of his death Stanley was 24 years of age. He was from Rochester, New York. Stanley is honored on the Vietnam Veterans Memorial at Panel 39E, Line 48. The decorations earned by PFC Stanley M. Jamrock include: the Combat Infantryman Badge, the Bronze Star, the Purple Heart, the National Defense Service Medal, the Vietnam Service Medal, the Vietnam Campaign Medal and the Vietnam Cross of Gallantry with Palm Unit Citation. Note: Stanley was wounded on 02/07/68 and died in a military hospital in Japan. 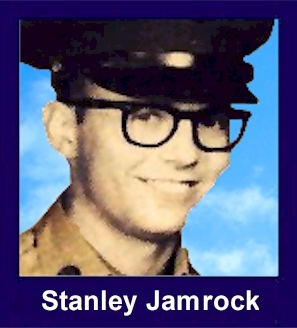 PFC Stanley M Jamrock, 24, the only son of Mr and Mrs Stanley P Jamrock, has been killed in Vietnam. He died of gun shot wounds suffered during a ground battle near Danang.Jamrock, or Rocky as his family and friends called him, was a graduate of Schurz high school and attended Northern Illinois University fro two years. He then went to DeVry Technical Institute for two and one half years. On graduating he accepted a job at Xerox Corporation, Webster, NY working in chemical research and residing in Rochester, NY. On April 29, 1967, he married Miss Janice Barnes, and on June 8, 1967 he was drafted. He was sent to Veitnam on November 10, 1967. PFC Jamrock was buried with full military honors at Holy Sepulchre cemetery, Rochaester, NY. Leading the funeral courtege was his brother-in-law, Jeffrey Barnes, a member of the Green Berets. Military service in a funeral home, his body was taken for service in Sacred Heart Cathedral, the church were he and his wife were members together and where they were married April 29, 1967. Besides his wife, he is survived by his parents Mr. & Mrs. Jamrock of Chicago, his sister, Mrs. Joel Scholn of Chicago and aunts and uncles.